Revisiting BLAKE'S 7 - Series A part 2 | Warped Factor - Words in the Key of Geek. Tony Fyler continues his look back at Blake's 7 Series A. We've already looked at the first half of Series A, from The Way Back to Mission To Destiny (you can read that here), today we continue from episode 7, Duel. Duel gets us a little more on track – oh look, there’s Travis, planning something devious with spacecraft, and there’s Blake, going bull at a gate and planning to ram him. This traditional space-opera malarkey then evolves into something more interesting at the intercession of two spooky women with phenomenal power, who determine if you’re going to take a life, you have to really take it, hand to hand and face to face. What unfolds is psychologically deeper than anything that has preceded it, showing us not only the mindsets of these two opposing characters. When Blake short-circuits the duel by refusing to kill Travis for the amusement of the two women, the lesson is of course valid, but rather wholesome and dull after an episode of tramping round a forest trying to outwit and ultimately kill each other. Project Avalon is a psycho-romp, plain and simple. Except of course plain and simple are two things it wouldn’t recognise in a line-up. The plot is mad – revolutionary leader Avalon, who looks like she’s 12, is captured by Travis. So far, so good. Servalan provides a very costly disease capsule which kills almost instantly, then dissipates soon after. O…K. Travis has an android Avalon built, and put in prison. He also – get this – equips Federation guards with little more than stun guns, in an effort to lure Blake to rescue Avalon, allow him to succeed, and then when the android Avalon is on board the Liberator, she will release the disappearing plague, kill the Liberator crew and leave the ship intact. Bear in mind this android is realistic enough to fool all but Avalon’s closest friends, and kicks the bejeesus out of Gan without breaking a silicone sweat and you have to ask why the virus is even necessary. Also bear in mind that this is described by Servalan in this episode as seeming “like an excellent plan” and you begin to wonder whether these people sleep on spiral staircases just to get their brains twisted. Needless to say, Blake rumbles the plan after Chevnor, one of Avalon’s friends dies at the android’s hands. 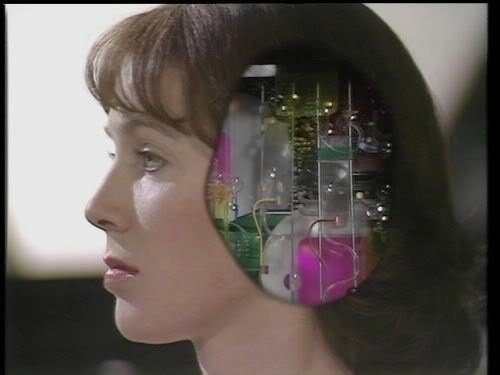 Avon reprogrammes the android, Blake delivers it and the plague virus back to Travis and Servalan, and takes the real Avalon out of their clutches – bizarrely before Travis has a chance to interrogate her for all the information she has on resistance movements. Breakdown is a handy reminder that Gan exists. Whether anyone is entirely thrilled about such a reminder is another question, but his limiter – the brain implant that stops him going psycho when he gets stressed – is freaking out, and the Liberator crew need to get him operated on before he cheerfully chews the furniture and throttles everyone to death. There’s a great performance here from Julian Glover, being high-minded and condescending as all get-out as leading brain-tinkerer Professor Kayn. What is perhaps most interesting in this episode though is Blake’s cold-hearted, terroristic methods of persuasion. Faced with Kayn’s refusal to operate on Gan (who is, as far as Kayn’s concerned, a terrorist responsible for chaos, disorder and death), Blake threatens the one thing the surgeon values – his hands, the repositories of his phenomenal skill. It’s the first moment in the series which brings the reader up short and makes us wonder whether Blake’s resistance actually could be considered as terrorism, and it’s uncomfortable to watch. The ending is faintly disappointing – Kayn in a moment of fury using his healing hands to kill, and subsequently not caring that everyone else on his space station will be exterminated by plasma bolts, but my goodness it’s neat. And Gan of course rejoins the crew, having had his limiter repaired. It’s almost the last time he will do something interesting in his life. What to say about Bounty… TP McKenna puts in a good, and by his standards quite refined performance as ex-President Sarkoff of Lindor (the planet of chocolate?). We learn that the Federation’s not all about drugged food and water – it can play a good game of interstellar vote-rigging too, having engineered the former President’s defeat and exile in a comfortable palace with a lot of old 20th century knick-knacks. And we get, hard on the heels of Bounty’s scene of Blake threatening Kayn’s hands, the same methods used again – our rebel leader casually destroying the records that give Sarkoff his comfort and delicacy, in order to give him no reason to stay in his gilded prison. There is a flare of Useful Jenna too, when an old pirateering colleague, Tarvin, boards the Liberator for the bounty of 13 million credits on the head of the crew. It’s a story that watches as if two plotlines from different sides of the tracks were thrust together in a room and told to mate. They do it, but neither of them seems ultimately very happy about the prospect, and it doesn’t work terribly well. The final two episodes of Series A are, like the first three, one real episode stretched out over more time than it actually deserves. Deliverance is two story-strands on the same theme, and as such it’s tighter than much of Series A – a man in a spacecraft almost dies when it explodes thanks to a little device from Servalan, and is rescued by the Liberator crew. He holds the ship hostage and demands they get him to his father, who will die without some micro power cells. Stranded on the planet where he crashed, Avon becomes a figure of myth and legend by providing ‘deliverance’ of some genetic race banks into space via an old-fashioned rocket. 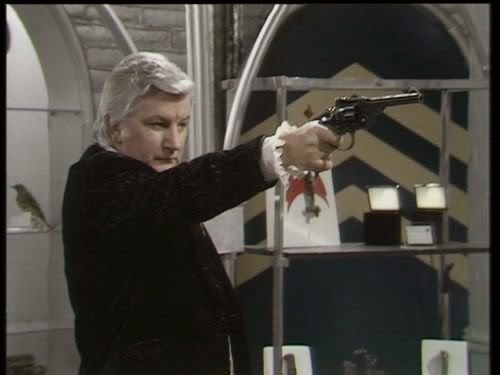 As another chance for Paul Darrow to shine as the viciously amoral Avon, it’s a great vehicle. Part two or the story makes up the final half of the arc – the Liberator crew race to Ensor’s father with medical supplies to save his life, hoping he will have anti-radiation drugs to help save theirs after prolonged exposure on the planet of Avon’s deliverance. And then of course there’s Orac. Orac is a mystery. An expensive mystery, to be sure, which is why Servalan decided to blow up Ensor’s son, allowing the father to die so she and Travis could simply waltz in and take it. Ensor, as it turns out, is a computer genius, his work underpinning every computer in the galaxy. Orac is a computer that can interrogate and reprogram any other computer without a direct link. Essentially it’s a combination of the internet, wifi, hacking software and a voice interface, so really speaking in 2014 you could probably build your own Orac. The series ends with a race against time, Blake gets Orac, Ensor dies and the Federation is going to have some words to say to Travis and the Supreme Commander. 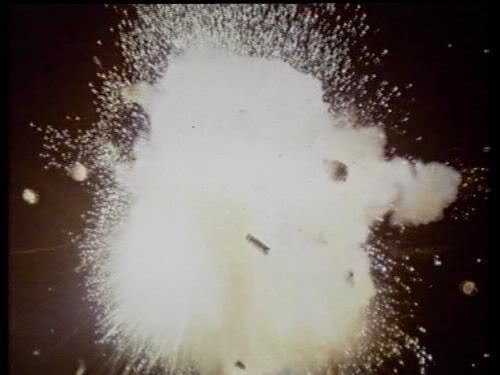 The final shot is of Orac the supreme digital clever clogs showing the future – the destruction of the Liberator, which is what in the business is known as a forced cliff-hanger, but does make you want to come back for Series B, just to see how they’ll wriggle out of it. In essence then, Series A of Blake’s 7 is roughly eight tightly plotted episodes of a dystopian science-fiction show - spread over 13 episodes. So why was it a success? Blake: They butchered my past and gave me tranquilised dreams! 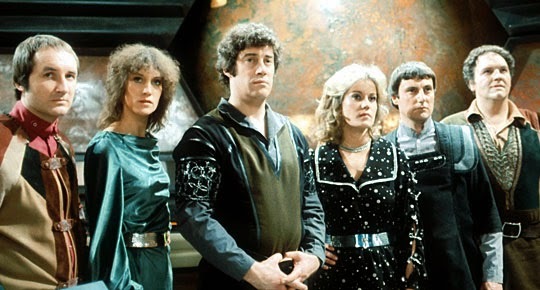 Avon: You’ve got a crew of five, Blake – Five and him. Vila: There isn’t a lock I can’t open – if I’m scared enough. Cally: I hope you die alone and silent. Jenna: That’s one way to become a hunted man: Trust the powerful. Travis: Run, Blake. I am your death. Servalan: You should know that in my position, one never approves of anything until it is an unqualified success. And despite everything, that’s what Blake’s 7 is: an unqualified success. The show was pitched as ‘The Magnificent Seven in Space’ – and that, ultimately, is the point of Series A. Some characters may be more magnificent than others, but it’s the characters, their interactions, conflicts and personalities that really make Blake’s 7 sing. They sparked curiosity and glued us to the screen when they were broadcast and even now, when the monsters are clearly dodgy, the plots demented and the dystopian bleakness exhausting, it’s the characters that make Blake’s 7, Series A worth watching again from start to finish. Next time we will look back at Series B.